Vision of the Muse was collaged by hand, using found paper images. It contains 33 cards, each with a one word message to provide you with guidance. The deck is full color, with vivid colors and cosmic imagery. 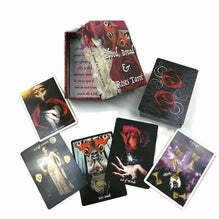 The deck is perfect for deepening your intuition and imagination. The cards are 3 1/2 by 5 inches, with a light glossy finish, antique gold edging, and thick card stock. They come in a beautiful lidded box. A guidebook is included with the deck, and tucked inside the box with the cards. It contains the divinatory meanings of each card, as well as information on cleansing the deck, grounding, centering, shielding, reading the cards, healing with colors, and card spreads.